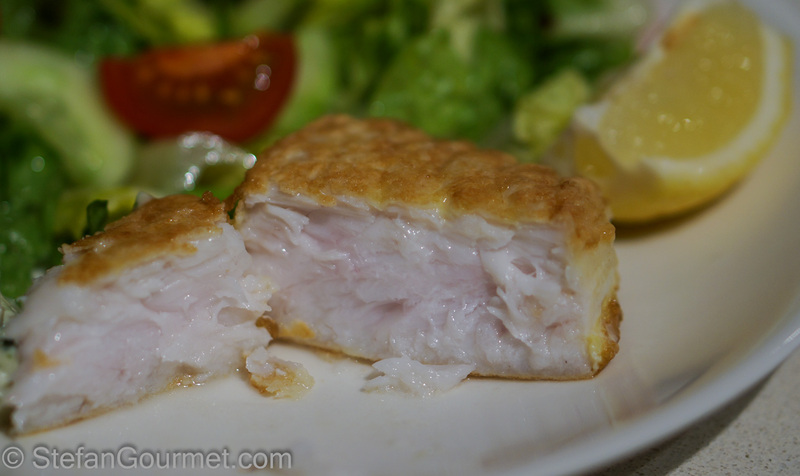 When we visited Spain recently, I tried Merluza a la Romana, which is hake covered with beaten egg and then pan-fried. Unlike its Dutch counterpart lekkerbekje or the British fish and chips, this Spanish version is not deep fried and not crispy. In that sense it is also different from fish fingers, which can be pan fried but are supposed to be crispy. What is does have in common with fish and chips is that Merluza a la Romana is often served with fries. Merluza a la Romana has a soft crust with an eggy taste (not surprising since the crust consists of egg) and tender moist fish inside. I’ve tried to recreate this at home and found it to be very easy and not as messy as making fish fingers. This is a tasty way to prepare fish that I will definitely use again. 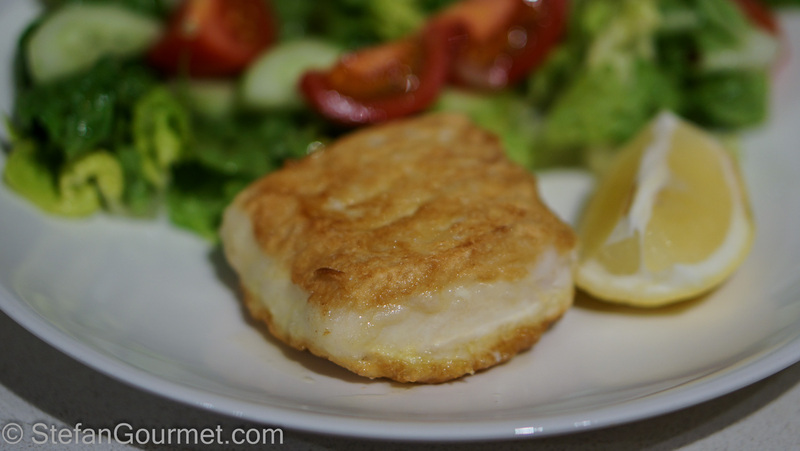 I prefer hake to similar white fish like cod and haddock as it has more taste. 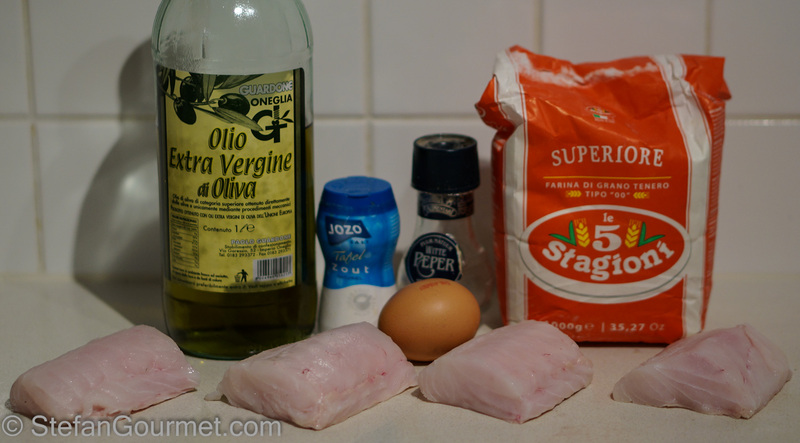 If you like you can use this preparation for any white firm-fleshed fish. Pat the fish dry with paper towels and season on both sides with salt and freshly ground white pepper. 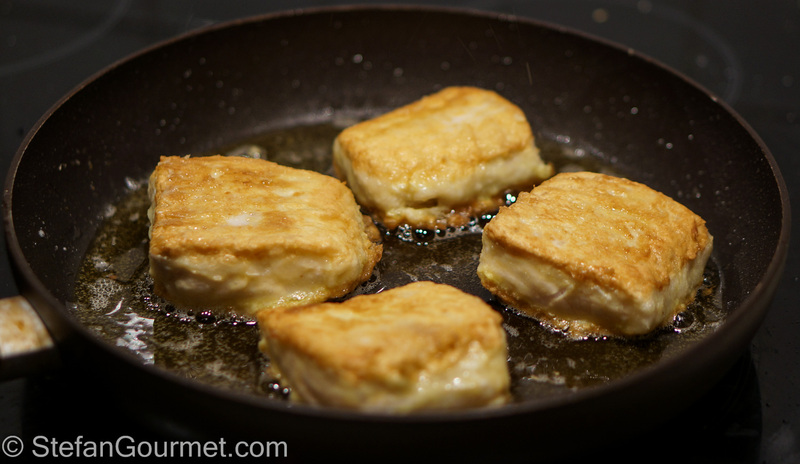 Unlike fish fingers, after dipping the fish in the egg it has to go straight into the pan, so it is important to have a frying pan ready to go. Heat up a generous layer of olive oil in a non-stick frying pan. Dust each piece of fish with flour on all sides and then dip it in beaten egg, making sure it is coated with egg on all sides. As soon as it is coated with egg, gently lower it into the hot oil. Repeat until all the fish is in the pan. Then cook for 2-3 minutes. 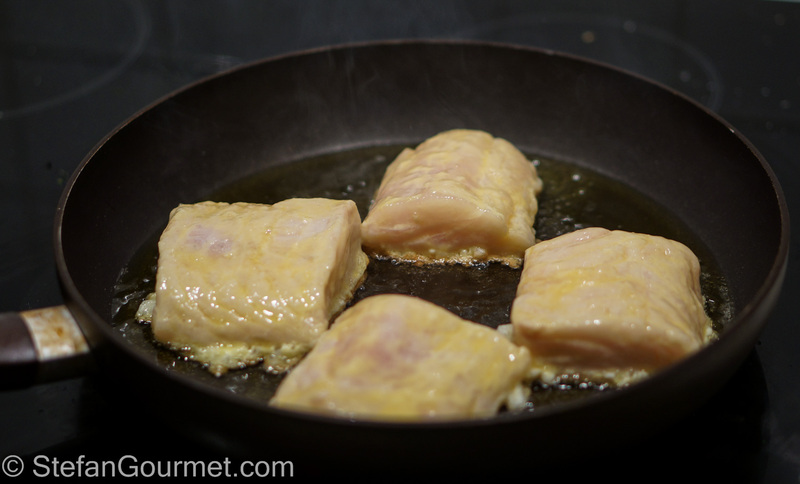 The cooking time depends on the thickness of the fish. Flip over the pieces of fish. They should be nice and golden. Cook for another 2-3 minutes. Insert a fork into the center of the fish to check whether it is cooked through. If the fork comes out warm, the fish is cooked. Serve at once with a lemon wedge and a green salad (and fries, if you like). I haven’t made this basil risotto since I posted about it two years ago, but I should make it again as I still remember that it was very tasty. Interesting method – 2 of the three coatings normally used when pan frying coated fish – flour, egg wash, and bread crumbs. The Spanish method seems to have skipped the bread crumbs. I must try to see how it affects the taste and texture. Because of the lack of bread crumbs it won’t be crunchy. Let me know how you like it! I could do this with any firm white fleshed fish. Lovely. I cooked a piece of cod, at the weekend, done in egg and then rolled in oats before frying. That too was lovely. I must repeat and post it. That’s interesting; I’ve never heard of fish breaded with oats before. Good idea to post it! Such a simple method, Stefa, yet look how moist it is in your 2nd photo! This would be the perfect change from the breaded fish that is usually prepared over here.